Polyhistorian, lexicographer, and inventor Faust Vrancic (Sibenik, 1551 – Venice, 1617), who was educated in Italy, became a bishop of Canad, after which he was staying in Rome, and finally, until his death, in Venice. He is the author of a five-language dictionary (publ. in 1595, including Croatian), as well as of books on logic and ethics (1616). He was also working on an account of Dalmatia’s history (the manuscript of which has, sadly, been lost). Of importance is his piece entitled Machinae novae (1595, 1615/16), including 49 different drawings and designs, many of which were his own originals. Among them, we may single out the model of an arched bridge, a mill driven by tides, and particularly the parachute which he even tested by jumping off towers and cliffs in Hungary and Italy. The physics behind a parachute is easy to understand. But making real ones are far from easy. Making toy parachutes seem like a good idea for an easy science project but experimenting with different variations is not as easy as tying strings to a fabric. Making parachutes for use in real life takes a lot of risk and accuracy. Continue below. Before modern parachutes gave us the thrill of skydiving it took a lot of guts for early investors to design parachutes that actually work and not fall them to their death. The history of parachutes went through a lot of development and a few deaths. The modern parachute was invented by Louis-Sebastien Lenormand in 1783. However there are earlier versions of parachutes created by a few centuries earlier. Before the silk parachute was invented, there were basic designs built that worked in the same principles. The earliest form was a cloak attached to wooden struts. It was made by an Arab Muslim named Arem Firman in the 9th century. He jumped from a tower in Cordoba and suffered only minor injuries. Parasols were used in China for entertainment. It allows entertainers to jump form high places and float to the ground. 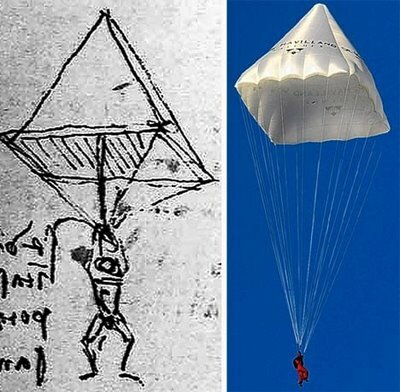 Leonardo da Vinci also sketched parachute with conical designs. It served as an escape device to enable people to jump from burning buildings. In 1617 Faust Vrancic was the first person to be able to make a successful jump with a parachute. Jean Pierre Blanchard developed his own parachute as a means to get off a hot air balloon. His first demonstrations were done with a dog as the passenger. He later on unintentionally put his invention to the test as he escaped from his ruptured hot air balloon. In the 1790’s he made a parachute out of silk which were more stringer and lighter than previously used materials. Early parachutes were made of linen with a wooden frame. Andre Garnerin invented the vented parachute in 1797 and made a successful jump using Blanchard’s design. The vented parachute improved stability during descent. Gleb Kotelnikov invented he knapsack parachute. It was popularized by Katchlen Paulus and Paul Letterman. The first major use of parachutes was in the military. It was by artillery spotters and pilots. Unfortunately the parachutes were heavy and pilots were not able to use it entirely. The German Air Service provided parachutes to their pilots. Unfortunately there were many setbacks that most of the pilots died when using them. Leslie Irvin was able to invent a parachute that can be used by pilots when jumping out of an airplane in 1919. The Irvin parachute became successful leading to the creation of the Caterpillar Club. Experiments on parachutes were continued by several countries. It was then used in surprise attacks by dropping soldiers in enemy lines in World War II. The soldiers were called paratroopers. Airborne forces and crew were trained and equipped with parachutes. Their designs were developed and improved over time. After the war parachutes were used in skydiving which is an extreme sport. The latest parachute is called Ram-air which has the same capability of a paraglider. It enables its passenger to control the speed and direction of the parachute for a soft landing. It’s made of nylon and uses the latest technology to prevent tearing.